It’s Tuesday! I got on the list! Have something for you to enjoy. 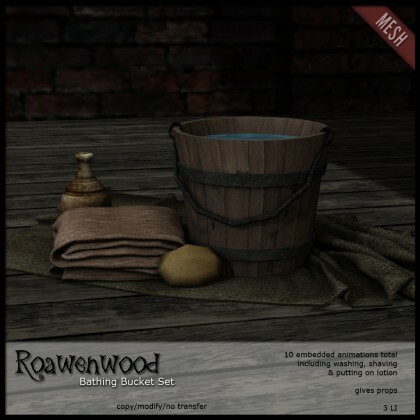 Bathing bucket, done all up with 10 different animations in it including bathing, obviously, applying lotion, shaving your legs and some other kneels, sits, that sort of stuff so you have a lil spot. Only 3 LI it gives props when needed. Embedded, no poseballs…. very nice *nods* 25L today and tomorrow at the landing to the main store. BUT that’s not the best part about today. Today…. is my rezz day. Nine (9!!!) years ago I wandered into SL and I have been knocking about ever since. It’s hard to believe that much time has passed. I can’t let that pass by without at least doing a little something hmmm? Come buy something and I’ll refund you 75% of the purchase price. Just one item, no monetary cap. If it’s a 5k item I’ll let you have it for 75% off. If it’s a 250L item, I’ll let you have it for 75% off. I know this means you have to front the cash, but I’m always good to my word and I -WILL- get your refund to you within a 24 hour window barring RL interruptions or problems with my internet connection. It’s been 9 years, a lot has happened, changed, come and gone….. but I’m still knockin around….. Help me celebrate with my gift to you. I don’t need your balances or anything, just the transaction stuff because it is easier. «—-» This offer is good at the Roawenwood main store on the Five Blades sim. Item must be purchased on the days from June 30th through July 1st 11:59 pm SLT to be able to claim the 75% refund on the purchased item. Item refund will go to the avatar who purchased it if it is given as a gift. Gift certificate purchases are not applicable to this offer. «—-» RENAME the NC! You have no idea how much I get in my stuff. If it’s “New Note” or something it will probably get lost. Take care and Happy Tuesday!